Deanna Shrodes: Nothin' like a little (or a lotta!) holy matrimony! Nothin' like a little (or a lotta!) holy matrimony! 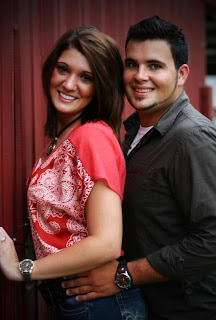 Today we're blessed to attend the wedding of Kaleb Conley and Haley Jo Honeycutt. Kaleb is the son of our dear long-time friends, Pastors Keith and Joy Conley, lead pastors of Harvest Assembly of God in Lakeland, Florida. We are thrilled for this beautiful couple and pray many wonderful years for them as they love and serve God and each other. Take some time today to pray for the marriages of those you are in relationship with in your family, group of friends, and church. Marriage wasn't started in the world or by our legal system -- it was ordained by God and starts in His holy Word. Something started by God is under assault like never before, today. There are those who seek to re-define something that has already been clearly defined by God all throughout His Word..
Join me in a prayer today for Kaleb and Haley, for all marriage and for the protection of the institution of marriage across our land.